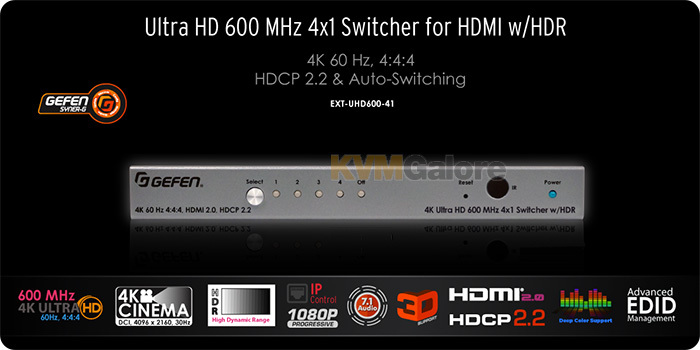 KVMGalore is now shipping new Gefen 4K HDBaseT™and fiber extenders, video splitters with built-in scalers, EDID management and audio-de-embedding, as well as switchers and matrices, all with 600 MHz full bandwidth support accommodating resolutions up to 4K Cinema-DCI (4096x2160 @ 60Hz 4:4:4), and 4K Ultra-HD (3860x2160 @ 60Hz, 4:4:4) along with High Dynamic Range HDR-10 and Dolby Vision™. HDCP 2.2 and the legacy HDCP 1.4 are both supported. Gefen, building on its commitment to provide flexible, high performance solutions for signal extension, AV distribution and switching, is now out with a product line that can utilize 600 MHz full bandwidth. The new 4K extenders employ Gefen's proprietary compression technology to extend the full 18.2 Gbps bandwidth and 600 MHz TMDS Clock of HDMI 2.0, in resolutions up to 4096x2160 at 60Hz and 4:4:4 chroma subsampling. This new compression technology ensures excellent image reproduction and strikes an exceptional balance between quality and cost. Capable of handling the most demanding specifications of the HDMI 2.0 standard, the new 4K 600 MHz matrices route up to eight 4K sources to eight 4K displays and also support resolutions up to 4K Cinema-DCI with HDR, HDCP 2.2 and 1.4, 3DTV pass-through and Lip Sync pass-through. Recognizing that audio is just as important as video, the matrices feature analog and digital audio outputs that break out the audio stream (2 channel analog, 2 channel PCM, and up to 5.1 channel Bitstream) from each HDMI source, allowing the de-embedded audio content to be sent to external amplifiers and music distribution systems for added impact in bars, restaurants, clubs, venues, and corporate offices. In addition, highest performance multi-channel digital audio is passed through, including 7.1 channels of LPCM and HBR (High Bit Rate) digital audio formats, such as Dolby Atmos®, Dolby® TrueHD, DTS:X™, and DTSHD Master Audio™. The new matrices include a Professional API feature that provides previously unattainable data, allowing for exciting interaction with third-party control/monitoring systems. Each source can be routed to any or all displays, using the front-panel push buttons or the included handheld IR remote control. An easy-to-read, super-bright OLED front panel display indicates routing status and IP settings. Control can be administered by using the IR, RS-232, IP, or Web interfaces. It's easy to install, configure, and manage. 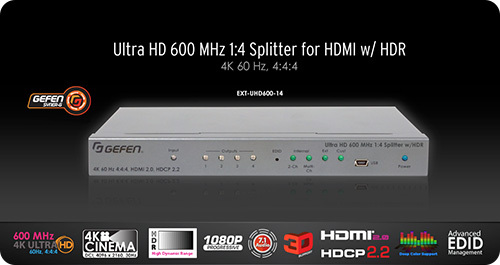 Distributing a single HDMI signal to two, for or eight displays simultaneously, new Gefen's EXT-UHD600 series of splitters take HDMI 2.0 to its highest specification of 4K 60 Hz at 4:4:4 chroma subsampling, along with HDR (High Dynamic Range) support. They go beyond the requirements of typical 4K systems, delivering stunning Ultra-HD and DCI/Cinema picture up to 4096x2160 pixels at 60 frames per second without subsampling color. This ensures that the scene shown on the display is every bit as brilliant as the picture that the camera captured. HDR lets every subtle nuanced gradation of each pixel play out across the screen in immersive clarity. In addition, EXT-UHD600A-12-DS 1:2 splitter also incorporates scaling, EDID management, and audio break-out functions in one product to help solving compatibility issues often encountered in installations including a mix of 4K and 1080p displays.